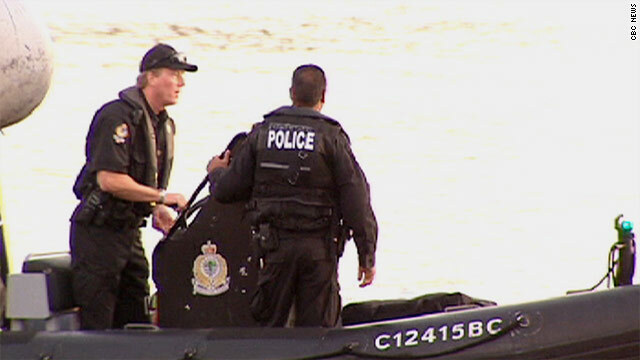 Police search the Vancouver inlet Tuesday where a severed foot was discovered. For the 11th time in the past four years, a human foot in a sport shoe was found on a Pacific Northwest shoreline. Foot No. 11 was found Tuesday near a marina in an inlet called False Creek, police in Vancouver, British Columbia, said. Foul play was not suspected because there was no sign of trauma, coroner Stephen Fonseca said in a report from CNN affiliate CBC. “These human remains did not show any evidence of trauma whatsoever,” CBC quoted Fonseca as saying. DNA samples from foot No. 11 will be compared to DNA obtained from family members in missing persons cases to try to establish an identity, he said. So who do the feet belong to and how did they meet their demise? One foot, found in August 2007 on Jedediah Island, British Columbia, was identified as coming from a deceased man whose family did not want further details released, according to a report in the Vancouver Sun. But the rest remain a mystery, according to a list in the Vancouver Sun. Mark Mendelson, a Toronto forensics consultant and former police detective, said on the TV program "Canada AM" on Thursday that he's not buying that anything nefarious is, well, afoot. "You have to think dirty," he said. "I don't know if you can look at this as just a coincidence," he said, pointing out that he thinks there are too many questions that don't have logical answers. "Why is it only happening on the west coast near Vancouver… why aren’t these feet floating up off Nova Scotia or St. John’s, Newfoundland, or off the coast of New Jersey," Mendelson asked. And why only feet in running shoes? Where are the rest of the body parts? “Body parts do eventually make their way to the surface. So why are we only getting feet? Why are they in running shoes,” he asked. Simon Fraser University forensics researcher Gail Anderson offers answers in a report on the website vancouver.24hrs.ca. And if the shoe floats? University of British Columbia materials engineering professor Anoush Poursartip tells vancouver.24hrs he has a theory on that. “The polymers used in running shoes are chosen partially for their light weight. This means the shoe has significant buoyancy,” he told the website. So the shoes are dragging the feet to the surface but leaving the rest of the body in the depths? “I’m not sure I buy the theory it’s because the shoe floats,” Mendelson said in the "Canada AM" interview. But one thing is certain, Mendelson said. After considering the many findings of these appendages, one must certainly consider there is a serial offender who is leaving a calling card. Namely "feet in running shoes". It is highly unlikely this many singular feet of different victims are being found just out of luck. Rule out suicides and focus on a serial murderer. The longer it takes to acknowledge this is what is taking place, there will be more victims.Police should surveil running paths, other running areas, or parks. The evidence is before you, the body parts are the same, and in a common area of location. If you are waiting for the "smoking gun" of evidence, or for the offender to stand up and say "here I am", then you (public) are foolish. Work this as a crime and put together a task force. four feet, over a four year period. not worth spending resources on. perhaps advise people to go running with a buddy, dog, or firearm. that is all. How can you find a foot that has been removed from its body and say that there was no trauma? re any of these pairs of shoes? That would reduce the number of actual people gone. I have heard that if they had gotten eaten by sharks, the shoe would protect the foot from being digested. And it wouldn't be considered trauma. I feel for the families, but the police have to solve this. Maybe Nike is conducting tests on PFDs "Personal footation devices"
Thanks for the update. It's interesting watching the police search in the aftermath of a crime. They scuba dive when it's the water, and they build the best scaffolding Vancouver has to offer when they need to check the outside of a building. Keep up the good work!